Albert Lewis-Roberts was born in Kimberley, South Africa, in 1896. Having distinguished himself at riding and shooting and on the sports field, he enlisted with the armed forces at the outbreak of the West African Campaign. But it was as a military pilot that ‘Bert’ became best known. He was commissioned into the Royal Flying Corps in 1917, serving under Head of Bomber Command Arthur ‘Bomber’ Harris and flying in combat at home and over the battlefields of Europe. In Egypt and Palestine between the wars, he helped to pioneer the great transcontinental air routes and police the British Empire. He tested and developed many new and untried aircraft, and during the Second World War he helped to develop the Lancaster Bomber and to train airborne forces. 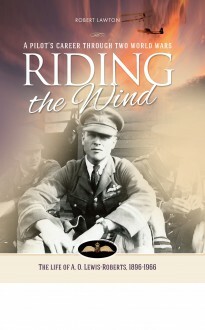 This fascinating account of a great pilot, complete with extracts from his highly entertaining letters home, has been written by his son-in-law, Robert Lawton.